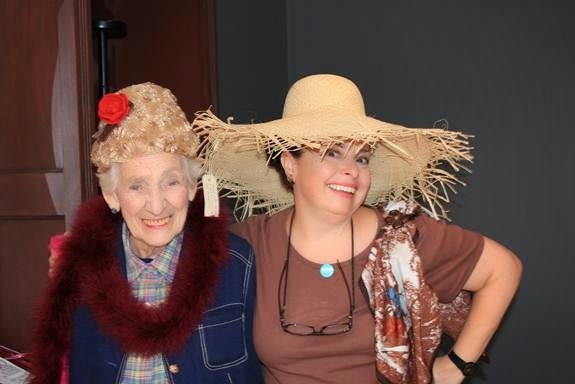 Jeannette and Denise at the Peabody Essex Museum's Hats exhibit in 2012; photo by Han. As you can see, the fabulous did not skip a generation! My honorary grandmother / great-aunt “Mrs. Baz” passed on today at 92; the mother / mother-in-law of family friends Denise and Han. I especially appreciated her because of the long-distance and other issues with my parents’ parents et al. One of my favorite “little” things about her was that when she gave my brother and I money, she would make the bills into fans and tie them with ribbons. When she heard that as part of my 21st birthday celebration I was going to Foxwoods for the first time, she made up the nicest gift box of fanned bills and quarters for me to gamble with. And when she saw that I was in the receiving line at the funeral home when her husband had died, she had Denise bring her purse so that she could make me a dollar bill fan before I got to her! I’ve never cried in public, but I came oh so close that night! May her memory be a blessing (as we say in Judaism). Here is the obituary in the South Coast Times.